The KONG Cat Cork Ball is made from natural cork. 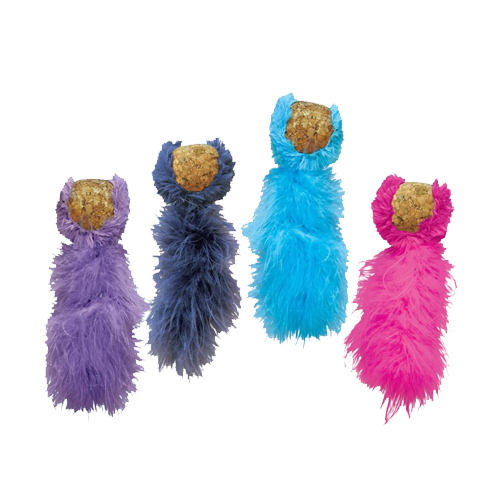 The added catnip and feathers make it an irresistible toy for your cat. Playing is both important and fun for cats. It prevents boredom and makes sure your cat stays active. The KONG Cat Cork Ball stimulates your cat to play and appeals to its chasing, hunting and catching instincts. The Cork Ball is made from natural cork. The added catnip and feathers make it an irresistible toy for your cat. Catnip contains nepetalactone, which is a stimulant for cats. Catnip is safe for cats; it does not contain any harmful substances. This product ships in assorted colours. This means colour choice is not available. Have you used KONG Cat - Cork Ball before? Let us know what you think about this product.